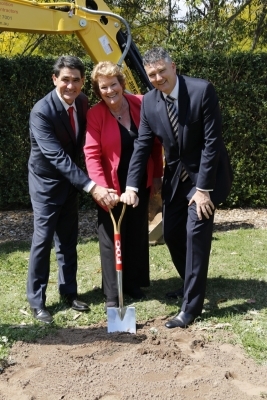 The Honorable Jillian Skinner, NSW Minister for Health & Minister for Medical Research joined families and friends of Ronald McDonald House Westmead to ‘officially’ turn the soil and start building a new ‘home away from home’ for families of seriously ill children. The Building Love campaign is raising funds to build a brand new Ronald McDonald House at Westmead to help meet the demand of families in need of a place to stay whilst their ill child seeks treatment at The Children’s Hospital at Westmead. To open the House by early 2017, the House needs to raise $31 million dollars. Joining Health Minister Skinner to show their support for the campaign were Geoff Lee Member for Parramatta, Lord Mayor of Parramatta, Councillor Scott Lloyd, The Hills Shire Councillor Mark Taylor and Channel 7 personality Mark Ferguson. Health Minister Skinner along with NSW Premier Mike Baird announced at the launch in February, the NSW Governments support by donating $10 million towards the new Ronald McDonald House at the Children’s Hospital Westmead and was excited to be a part of such a significant day. Ronald McDonald House Westmead Executive Officer Mike Thomas was thrilled to be able to official get the new building underway after years of planning. “We have already had generous support of the NSW Government, Ronald McDonald House Charities Australia, Channel Seven and numerous corporate and community groups, but we still need to raise more funds to reach our final target of $31 million’, he stated. “In 2014 we were forced to turn away over 400 families from our doors as we just did not have the room. That is nearly one in every two families who came to us during the toughest time of their lives. There is an urgent need to build a new House to accommodate the families of seriously ill children who need to stay together,” said Mr Thomas. “We know families are stronger when they are together and our new House will be a place of comfort, love and hope to even more families in need - we look forward to seeing the House that love built open in 2017,” concluded Mike Thomas.